You’re going to have to bear with me here. Like, a lot. But if you can just give me a chance, I think that I might have something interesting here. Sound good? 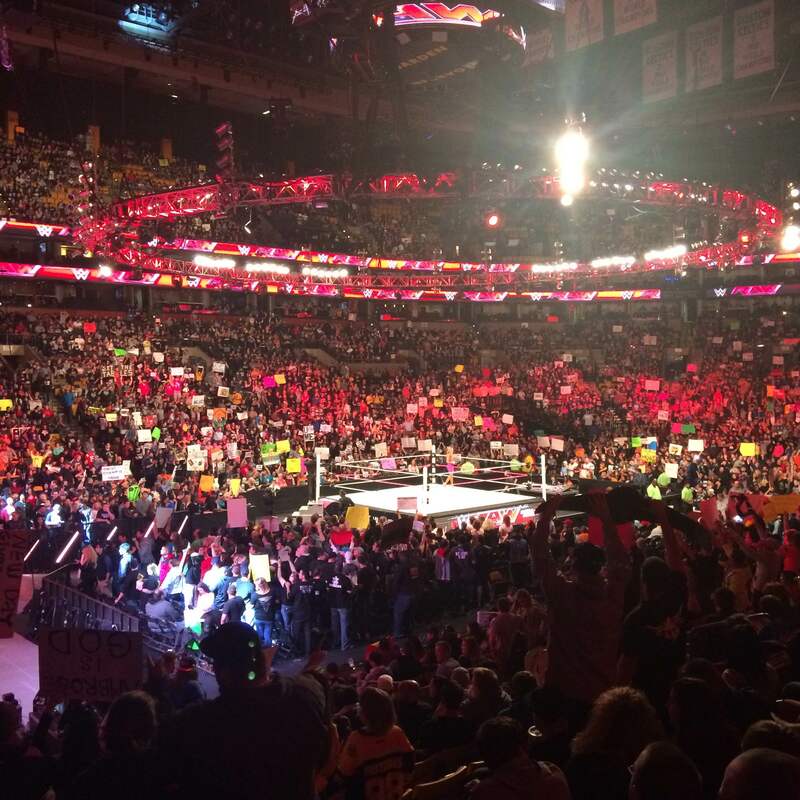 This Monday I took myself to the TD Garden to see WWE Raw live in person. Like I said, bear with me. As an on and off wrestling fan for the last 11 years I had never gotten the chance to go see one of the televised programs in person. Over the last few months, both as a bit of curiosity and as a bit of entertainment, I have been following the WWE more than I have in years. But my reasoning behind it is entirely different. For one thing, I am fascinated by emerging media in today’s society. The WWE holds a curious distinction as being one of the first content providers to cut themselves away from the distribution channels and handle it all in house. The WWE Network functions both as a back catalog device, letting fans watch old matches on demand, and as a live streaming device, as I type this the latest show will go live on the Network. The WWE Network lets you cut out the middle man. HBO Now is the same idea – pay them directly to subscribe, no cable needed. But further, I am fascinated by pro wrestling as a function of character development. I’m always more interested in characters than the stories they are a part of. This is why The Simpsons will never get old to me, Homer, Marge, Lisa, and Bart are all quality characters to enjoy. But pro wresting is relatively eternal. Even when some outlets – see: former WWE competition WCW – fold their characters (Sting, Goldberg, Booker T, etc.) will live on anywhere a ring lives. The career trajectory of Triple H was followed along these guidelines to chart how this fictional person has lived for the last 20 years in the video “Wrestling Isn’t Wrestling” by Max Landis, likely my favorite video of 2015. So why does that all matter, you ask? It’s because I was not just going as a fan, but as someone curious as to how this ongoing television show operates. The key is to understand that it’s fiction. One of the guys I sat next to was entirely bought into the reality of the show. He would boo every villain and and cheer every hero. I think he may have hated me by the end of the night, because my favorite wrestlers are almost universally villains. That’s because, as is true with most other fictional outlets, villains are more complex. John Cena doesn’t give up, and that’s why he’s Superman. Kevin Owens has forever been relegated to the minor leagues and is only now getting his chance at the top level, meaning he has an ax to grind with the world, thus making him the best villain character on the roster today. The WWE Raw show was admittedly one of the more entertaining nights possible, save for the quickly learned lesson that indoor fireworks are loud as all hell. Again, it’s clear to most that it’s all live theater. They’re playing the roles. But some of these people are exceptional actors. Look at Dwayne Johnson, quickly becoming one of the biggest movie stars today, and understand he will never have a performance better than The Rock. That’s because The Rock transcends “that fighting show” that you flip past on cable to the point that you could probably quote more than one of his catchphrases if you tried. What’s especially fascinating about the WWE is that, unlike other fictional shows, there are call and response moments where the crowd matters. Brock Lesnar kicked off the show in Boston and the former UFC heavyweight champion was greeted with gigantic cheers. Even if he’s playing the monstrous “Beast” character, Lesnar is loved for being superhuman. Ditto to John Cena for all attendees younger than 15. Kevin Owens and current WWE champion Seth Rollins, both the lead villains of the show, draw cheers from the people old enough to recognize it’s more fun to root for evil. That and that Owens specifically is hysterical. Watching the wrestlers in person does admittedly change the perception to which you think it’s staged. The winners are predetermined, the rivalries constructed, but the bumps are entirely authentic. There is no clean way to fake Seth Rollins being slammed through a table. As awesome as it is, that hurts. They’re fictional beings with real pain. But what’s the main takeaway here? Wrestling, as Landis points out, isn’t wrestling. It’s live theater. It’s a television show constantly filmed in front of a live studio audience. It’s a story with chapters being perpetually added. And when you take that all into account – when you understand what’s going on and look at the program through the correct lens – the picture becomes clear. There are few to no other forms of entertainment where characters, as ridiculous as they may be (looking at you, Undertaker), can live on for decades at a time. Further, there are few other opportunities to give characters as deep of back stories as they do here. Because when you treat it like television, it get’s interesting.